Grayslake, Ill. – The Illinois Health Facilities Planning Board yesterday approved Northwestern Lake Forest Hospital’s proposal to designate the Grayslake Acute Care Center as a Freestanding Emergency Center (FEC). “The Freestanding Emergency Center will treat a wider range of injuries and improve emergency response time for patients in the northwest part of Lake County,” said Thomas J. McAfee, President and CEO of Northwestern Lake Forest Hospital, which owns and operates the facility. With today’s approval, the facility may now be licensed as an FEC by the Illinois Department of Public Health. The facility will utilize 14 emergency treatment beds in addition to the necessary ancillary services already on-site, including advanced diagnostic imaging, cardiology, physical therapy, and medical offices for many of the area’s physicians. Currently ambulances have to bypass the Grayslake facility to take patients to other area emergency departments, but with today’s approval ambulances will now be able to bring emergency patients to Northwestern Lake Forest Hospital’s FEC to be treated. “For any emergency patients that come to Grayslake and do need admission to a hospital, an ambulance will be on-site 24-hours-a-day to transport them to the appropriate hospital for admission,” Franaszek continued. The Grayslake Acute Care Center, located at 1475 E. Belvidere Road, is already open 24-hours-a-day every day of the week and is on pace to treat approximately 30,000 patients in 2008. The center is staffed by Northwestern Lake Forest Hospital’s board-certified emergency physicians and trauma-trained nurses. Patients who already use the Acute Care Center services in Grayslake will still be able to utilize the facility for acute, non-emergency care. The licensed FEC will expand the number of patients who can be treated at the facility. 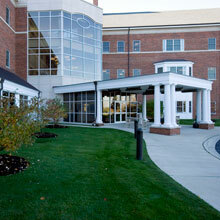 Northwestern Lake Forest Hospital anticipates that the FEC will begin accepting ambulance transports in January 2009.